The organisers of the robotics competition posted this photo of the Burundi team ahead of the event. They did not name the team members. 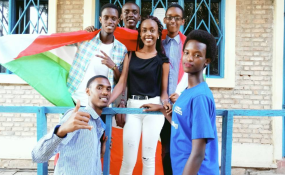 Six Burundi teenagers have vanished after taking part in a robotics tournament in Washington DC. Police said they suspected no "foul play," feeding speculation that the group wanted to avoid returning home. The group's adult chaperone first noticed the teens were missing after the event ended on Tuesday, while checking the dorm rooms where they had been staying. He discovered that all of his team's baggage was also gone, and found their room keys in his own bag. "There were indications that the students' absence may have been self-initiated, including leaving all their keys in their mentor/chaperone's bag and the removal of students' clothes from their rooms," competition organizers said in a statement. "We don't have any indication of foul play and we're continuing to investigate this case," police spokeswoman Margarita Mikhaylova said. The FIRST robotics competition in Washington DC drew international attention last week after Afghanistan's all-girl team was denied US visas, prompting public outcry. They were only allowed to travel to Washington and enter the contest after a personal intervention from President Donald Trump. Nearly 160 other countries also sent their teams for the international event, which saw pupils compete in ten different categories.